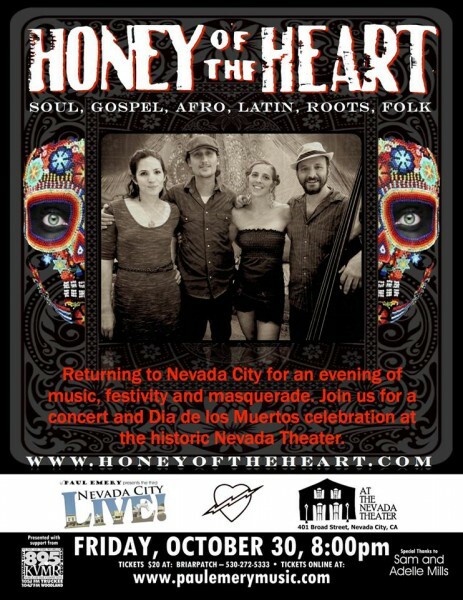 Honey of the Heart returns to the Sierra Foothills for a special night of music, festivity and masquerade. Join us for a concert and Dia de los Muertos celebration at the old historic Nevada Theater in the heart of Nevada City. The show promises to be unique and magical, combining the playful mystique of a masquerade ball, the get-down, dance party fun of a Halloween concert and the elements of a Dia de los Muertos soul & ancestor-honoring ceremony. -Be ready to dance the bones given to you by your ancestors along this thin veil between the worlds. -Be moved by the sounds sights and call to the presence of this shared human experience. -Don your finest costume and receive a harmonic, honey’d elixir of sound. Honey of the Heart (fronted by Justin Ancheta and Maren Metke) is described as “a feast for the senses and a balm for the soul”, leaving you with “chills and an open heart”. This versatile, inspiring duo, backed by their dynamic and talented band, weaves together soaring, rich vocals and melodies… haunting, epic, three-part harmonies… contagious polyrhythms infused with deep, soulful presence and skill.